Charlie Sloth Weekdays 9-11 meaning the one hour slot has been dropped - new home for documentaries, The Surgery and potentially Phil Taggart losing out again. Huw back down to a two hour show 11pm-1am? There's something in the way that DJ Limelight wrote his tweet (I might have misinterpreted it) suggesting his show and Kan D Man's show is a double header, as it is on the Asian Network, so at least one of them will be on Saturday nights 1-4am, replacing Target. Target to 1Xtra drive perhaps? No signs so far on what Katie Thisleton or Cel Spellman's new shows are as of yet but Danny's confirmed he's leaving Saturdays which means there's a gap between 4-7pm - perhaps Cel's been given both days or perhaps they'll both present both days, but the documentaries and Surgery still need to be given new slots - maybe back to Sunday nights, if the rock show is shortened by an hour and Phil Taggart starts an hour later? More to the point, it was only three years ago that the nighttime schedule was rationalised to save money - why are they bringing back more shows and more presenters (albeit some of it simulcast)? Interesting changes, but not necessarily ones anyone particularly wanted. Jordan is long overdue early breakfast. There has been no official press release yet, either by the BBC Press Office or the R1 press office – just an article on Newsbeat’s website. Even then it is still patchy. Charlie’s new show starts on Monday 6th November. MistaJam will replace Charlie on 1Xtra drive, but no word on Jam’s replacement. There is mention of a new show for DJ Target but does not give a time slot. You are correct in saying that Kan D Man and DJ Limelight will present a show together on Sundays between 1am and 3am. This part replaces Target’s current show. Cel and Katie will present on Sundays between 4pm and 7pm. The new show will be called ‘Life Hacks’ – to me, it suggests that The Surgery will be either dropped or merged into this new show somewhat. R1 will also launch three new entertainment and music podcasts. These will be broadcast between 3am-4am on Wednesday-Friday mornings. The 4pm-7pm slot on Saturdays is still vacant (I would LOVE Jordan North to be given a shot at this!). If he doesn’t, it is a huge shame as he is brilliant. Phil Taggart loses out again! Poor Phil Taggart - I wonder Ben Cooper has against him that causes him to keep being screwed over by schedule changes. Did the specialist chart even last a year? Also still nothing regarding the future of Radio 1's Stories. But if correct about The Surgery being merged with life hacks, nice to see it back on a Sunday, and also nice that they've decided to do something proper with the old chart slot - Cel's show felt a bit purposeless without a proper format, and nice that they're bundling the ex-CBBC presenters together. But how much is this all costing?? Seems a bit unfair to all the specialist DJs who lost their slots three years ago when it went over to 3-hour overnight shows. I can't remember when the Specialist Chart was introduced but, in my opinion, maybe it's a good thing that it's being dropped. There are too many charts on the station as it is - The Official Chart on a Friday, Dance Chart on a Saturday (which will probably be dropped after Danny moves to Fridays) and Cel's 'Most Played on R1' chart on a Sunday. Phil does a lot of work for VEVO so it's not like he'll be sitting around waiting for Sunday at 10pm to roll around. Perhaps we'll see more of him doing weekend cover, especially if Jordan does get the 4pm-7pm on a Saturday. UPDATE: The R1 official press release confirms that The Surgery and Radio 1 Stories/Documentaries will be incorporated into the revamped 4pm-7pm Sunday show. Shame that Jordan is still on the subs bench for now. The only way out of the current impasse the schedule has reached is for Grimmy or Scott to go - and I know who I'd rather. Will be very different in the evenings without the 1 hour documentary style shows. Just with Danny on Friday night and Residency on Thursday!!! And the Sunday morning specialist show is 1-3am, the breakfast show starts at 6:30 and Dev starts at 6. I am still confused as to why they've reverted back to 2 hour evening shows. I thought the whole point of 3 hour shows was to save money? Big boss Ben did say that Radio 1 is different because it listens to the listeners, maybe the longer specialist shows were boring listeners? I know people who love radio 1 but go to other stations of a night/evening because of the shift in music, while this hasn't really changed, I think Charlie Sloth's new show is a massive game changer for youth radio if executed correctly! I'm really looking forward to that show and listening to radio 1 of an evening! Radio 1 is Where It Begins! Radio 1 and 1Xtra are taking Charlie's show - easy costcutting there. So what's going to be happening with the 10pm Monday - Thursday Newsbeat bulletin then? Would sound a bit odd right in the middle of Charlie's new cutting-edge show... Perhaps it will be moved to 9pm? Or maybe just dropped altogether - it's odd it survived in the first place when they cut news during early breakfast, and I think once upon a time, there was a midnight bulletin as well. Correct. In the late 80s/early 90s, there were hourly news updates from 6:30am-8:30pm then at 10:30pm and 12:30am on weekdays, along with the 15 minute programmes. The changes are certainly interesting. Negatives first Mista Jam on Dance Anthems why? Made more sense to move Dance Anthems with Danny to Fridays 7-10. On the plus side Cel Spellman and Katie could really work. Promoting Charlie makes perfect sense- he's great and I think a show with him could bring some much-needed life to nights, in the style of Nick Grimshaw's old 10pm show. Annie, Charlie and Huw is a really strong post-7pm schedule. Shame to see Huw bumped to 11pm but always thought 3 hours was too long. I'd ditch the Residency and have him on Monday-Thursdays 11pm-1am so you have a consistent line-up. 3 very distinct shows which will be great. The 9pm shows had become stale and time-fillers : R1 Stories repeats, Residencies that made no impact on the station etc. Even Phil's specialist chart seemed unnecessary. Great to see Danny promoted to Friday nights- didn't realise it has been 6 years on Dance Anthems! Annie Mac, Pete Tong, Danny Howard, B Traits- wow, that's impressive. Mistajam the perfect replacement for Danny too, he'll be great. Putting Katie and Cel together is a smart move- a bit more direction & purpose for the slot and I think Cel was still struggling to hold down a 3 hour show by himself. Great to see the 2 hour shows back and an exciting, diverse nighttime line-up. When do these changes come into effect. I imagi5next month? 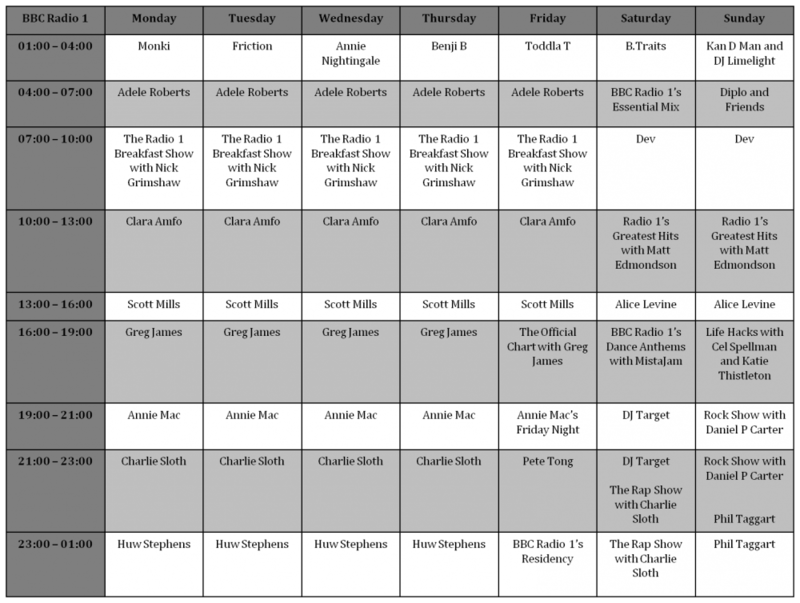 Charlie's show is only Monday to Thursday 9-11, Pete will be back in his old slot of 9-11 on Fridays! Friction is leaving Radio 1, to be replaced on the drum n bass show by René LaVice from 7th November.